Our food would not be safer if it was free from chemicals – our food would just be non-existent. It is meaningless to ask “is a chemical safe or dangerous”? Safety depends only on the amount of a chemical. * Dihydrogen monoxide (H2O, water). * Magnesium chloride (MgCl2) – common salts. * dimethyl-trimethylcyclohex-enyl)nona-tetraen-ol, aka Vitamin A, aka retinol. For every one of these, if we have too little we will die. If we have too much, we’d also die. Safety depends only on the dose. Many chemicals are absolutely necessary. Would you eat one if you knew what it was made of? These chemicals are all safe and healthy – in the quantities that they exist in this food. Ethyl butyrate creates part of the smell and taste of banana, pineapple, and strawberry. 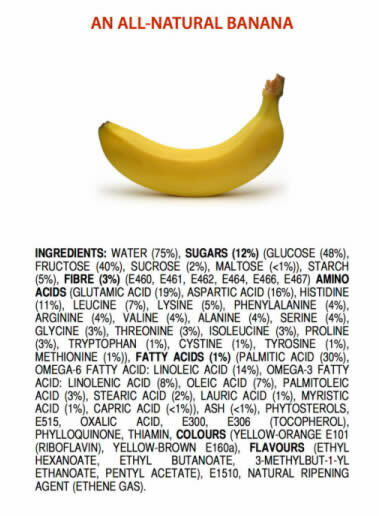 Consider Isoamyl acetate (aka isopentyl acetate), also from banana. These are chemicals, yet entirely safe. Now what if you took one of these chemicals but consumed 1000 times the normal amount? Does this “prove” that this chemical is really dangerous? 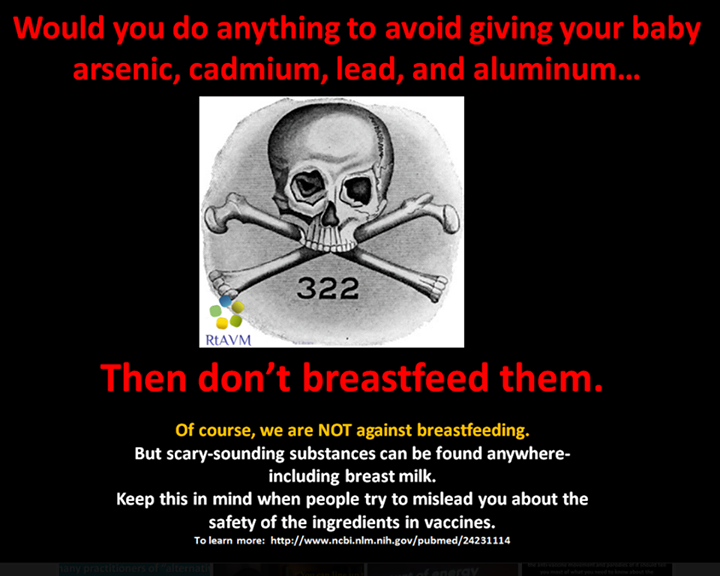 Not at all – because most chemicals have no danger below a certain dose. 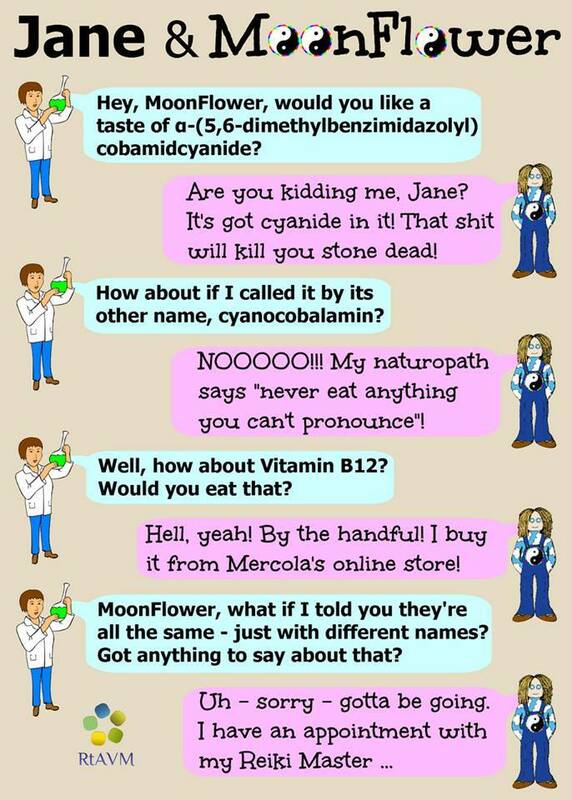 When you hear someone say that a chemical “causes cancer” – know that most chemicals in natural foods could do the same thing, if given in massive over-doses. Arsenic, cadmium and lead are heavy metals, normally considered poisons. We never add them on purpose to food. We monitor foods to make sure that they’re below a certain level. But should we demand that our foods have zero amounts of these metals? No way. Those metals exist naturally, in small amounts in Earth’s crust and soil. So they’re taken up in small amounts in most of our foods. There is no such thing as food without tiny amounts of these metals. If you tried to totally avoid them, then you’d starve to death. The chemical isn’t the problem – it’s the amount that matters. CO (Carbon monoxide) – in normal atmospheric amounts – is harmless. But in larger amounts produced by a malfunctioning home heating system, or a car in a garage, CO is deadly. Sodium fluoroacetate – This occurs naturally in dozens of plants in Australia, Brazil, and Africa. This plant is extremely toxic to any animal that eats it. When concentrated in pure form, it is sold as a pesticide called “1080.” Nasty stuff. During cooking, countless organic chemicals are produced. This is true even using organic foods and old-fashioned cooking methods. If these chemicals were isolated and eaten in overdoses they would cause cell damage or cancer. Does that mean that all cooked food is deadly? Obviously not. So what is the logic failure here? It’s not the molecule – it’s the amount. Are “carcinogenic” chemicals produced when foods are cooked a cause for concern? Cooking food is the major process adopted to produce flavor chemicals, which give foods a characteristic desirable roasted or toasted flavor. More than 1,000 low molecular weight compounds are known to be produced once a food is heated, and the number of known compounds is increasing steadily. The amounts of these chemicals formed are generally in very trace levels (around the level of µg/kg of food or parts per billion, ppb), but for most of these compounds, detailed information about possible toxicity at this level is not yet established. One of these compounds is 4-Methylimidazole (4-MEI), which forms from a reaction between amino acids or proteins and sugars, carbohydrates, or lipids when exposed to heat. This past March, an independent study commissioned by the consumer interest group Center for Science in the Public Interest (CSPI) found that four of the best-selling sodas (Coca-Cola, Diet Coke, Pepsi and Diet Pepsi), which use caramel color produced by heating sugar and ammonia, contain potentially unsafe levels of 4-MEI, which according to the report had recently been linked to cancer. “The average amount (138 µg) of [4-MEI] that our tests found in a 12-ounce can of [cola] is 4.8 times greater than California’s 29 µg-per-day limit, indicating a lifetime risk of cancer of 5 out of 100,000 people,” CSPI Executive Director Michael Jacobson wrote in a letter to the US Food and Drug Administration that described the results of the study. This has caused a stir in the consumer research community, with many advocating for the reduction or elimination of 4-MEI from marketed food and drinks. ….this concern over the presence of 4-MEI in popular soda brands is just the latest in the periodic excitement that is stirred up over chemicals that are formed in foods when they undergo processing and cooking. Other potentially carcinogenic chemicals that have raised concerns in the past include polycyclic aromatic hydrocarbons, N-nitrosamines, aromatic amines, and acrylamide. Whenever one of these carcinogens is reported in cooked food, many people from various specialties, including food sciences, regulatory agencies, and medicine, not to mention consumers, react by giving the new chemical concentrated attention and intense discussions about how to reduce it. However, in each case, after some time has passed, attention fades away, in part because there is no practical way to remove these chemicals from cooked or processed foods and also because there is no evidence that the trace levels consumed present any health risk to humans. All substances are poisons; only the dose differentiates the poison from a remedy. This concept was developed by Paracelsus, a medical doctor in Europe in the 16th century, and it is useful in evaluating risk in our daily lives by considering examples of well-known substances with low and high toxicity consumed today. For example, water might be considered one of the least toxic substances that we commonly encounter. However, there are many reports of water toxicity in the scientific literature. Too much water can, indeed, be fatal. For example, in 2002 a student was undergoing a fraternity initiation ordeal, in which he was required to drink up to 5 gallons in a short period of time. Consumption of this amount of water resulted in the dilution of the electrolytes in his blood to the point that normal neurological function was lost, and the young man sadly died. ….In the case of 4-MEI, the amount present in foods is extremely low and it is hard to predict any kind of adverse health effect at these levels. People have been consuming numerous heat-induced chemicals, including 4-MEI, since the discovery of fire some half a million years ago, and there has been no clear evidence of any specific health problems to date. Thus, while it is extremely important to continue ongoing research to determine the toxic level of 4-MEI, I personally choose to enjoy flavorful, cooked foods, without fear for my health. Does this mean that everything is safe? 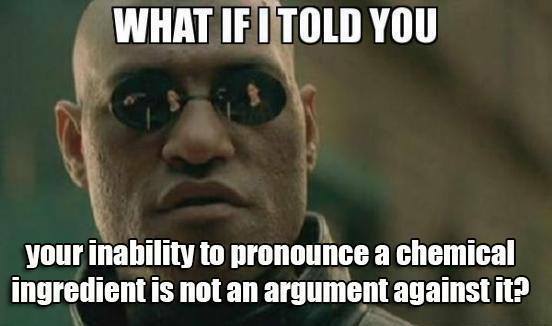 Not at all. This is just to show you that chemicals, in general, are nothing to be afraid of – and in fact, they are what you are made of. What kinds of foods do cause cancer?It depends on the specifics: what type of meat & how was it raised; what type of plant and how was it farmed; how much was consumed, and how often. There is a growing body of evidence that eating meat in large quantities is a health risk. Eating only small amounts of meat, in contrast, does not appear to be risky. also, free-range naturally fed cattle appear to have a different profile of fatty acids, and they possibly may be better for you. In the United States, researchers studied Seventh-day Adventists, a religious group that is remarkable because, although nearly all members avoid tobacco and alcohol and follow generally healthful lifestyles, about half of the Adventist population is vegetarian, while the other half consumes modest amounts of meat. This fact allowed scientists to separate the effects of eating meat from other factors. Overall, these studies showed significant reductions in cancer risk among those who avoided meat.4 In contrast, Harvard studies showed that daily meat eaters have approximately three times the colon cancer risk, compared to those who rarely eat meat. A number of hypotheses have been advanced to explain the connection between meat consumption and cancer risk. First, meat is devoid of fiber and other nutrients that have a protective effect. Meat also contains animal protein, saturated fat, and, in some cases, carcinogenic compounds such as heterocyclic amines (HCA) and polycyclic aromatic hydrocarbons (PAH) formed during the processing or cooking of meat. HCAs, formed as meat is cooked at high temperatures, and PAHs, formed during the burning of organic substances, are believed to increase cancer risk. In addition, the high fat content of meat and other animal products increases hormone production, thus increasing the risk of hormone-related cancers such as breast and prostate cancer. Nutrition Students will gain the knowledge and skills to select a diet that supports health and reduces the risk of illness and future chronic diseases.